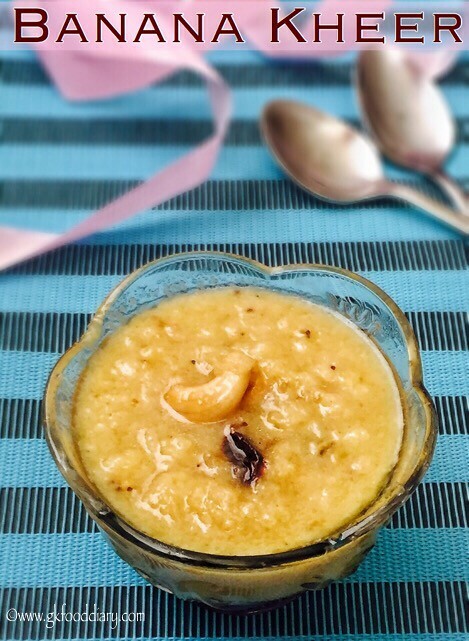 Banana kheer – tasty dessert made with Kerala long banana /Nenthram pazham, nuts and coconut milk! Kerala banana is a great healthy food for growing babies and kids, that helps in healthy weight gain too. My daughter likes all banana recipes and so this yummy dessert. 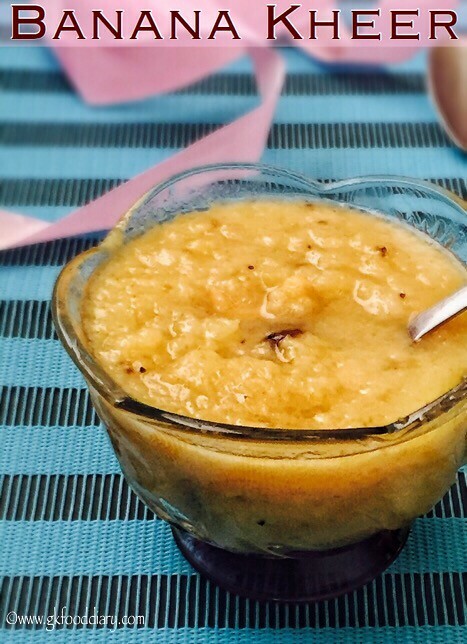 This banana kheer is sure a healthy treat to babies and kids, as it tastes so good and yummy. This banana kheer can be given to babies from 8 months. Now let’s get on to check this banana kheer recipe for babies toddlers and kids . Banana Kheer - Easy and yummy kheer made with long bananas, nuts and coconut milk. Keep all the ingredients ready. Take the banana, peel and mash it well with your hands or fork. Set aside. Ghee fry the cashews&raisins and keep it ready. 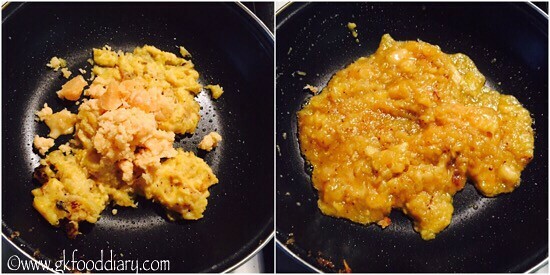 Heat ghee in a pan, add mashed banana and fry it well for 3-5 minutes. Now add powdered jaggery to the banana along with crushed cardamom and mix well. Now stir everything in a low flame for 3 to 5 minutes. Then add thin coconut milk and mix well. 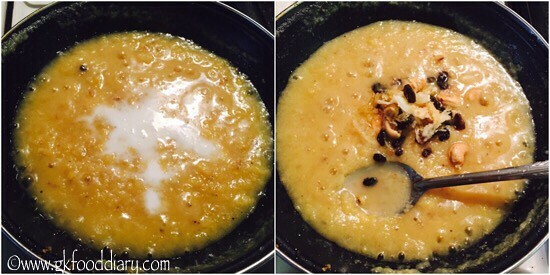 Cook in low flame with occasional stirring until the kheer becomes slightly thick. Once everything comes together and when the kheer consistency is reached, add thick coconut milk , ghee fried cashews & raisins. Mix well and cook switch off the flame once done. 1. Keep all the ingredients ready. 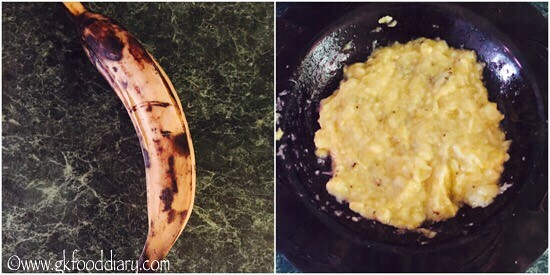 Take the banana, peel and mash it well with your hands or fork. Set aside. 2. 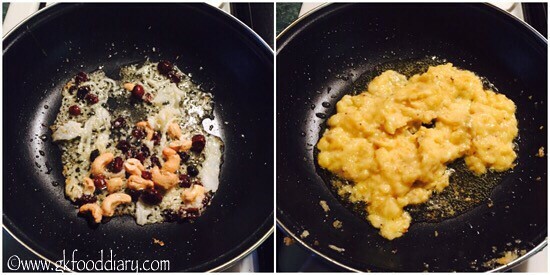 Ghee fry the cashews&raisins and keep it ready. Heat ghee in a pan, add mashed banana and fry it well for 3-5 minutes. 3. Now add powdered jaggery to the banana along with crushed cardamom and mix well. Now stir everything in a low flame for 3 to 5 minutes. 4. Then add thin coconut milk and mix well. 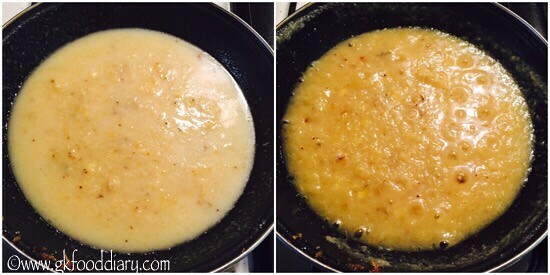 Cook in low flame with occasional stirring until the kheer becomes slightly thick. 5.Once everything comes together and when the kheer consistency is reached, add thick coconut milk , ghee fried cashews & raisins. Mix well and cook switch off the flame once done. Tasty and healthy banana kheer is ready! Serve warm ! If using store bought coconut milk, dilute 1/4 cup of Coconut milk with 1/4 cup of water to get thin Coconut milk. Instead of coconut milk you can use milk for babies above one year. But the flavor will be different. Avoid jaggery for babies below one year. Skip whole cashews or raisins for small babies as they lead to choking hazard. Instead add nuts powder. 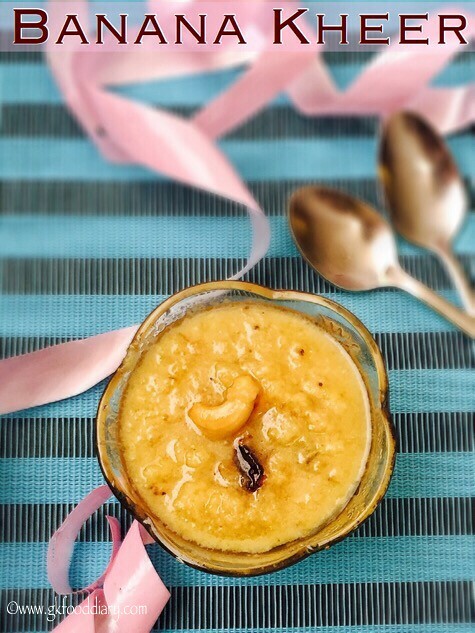 This banana kheer becomes little thicker when cooled down. So switch off the flame when it is little thick. 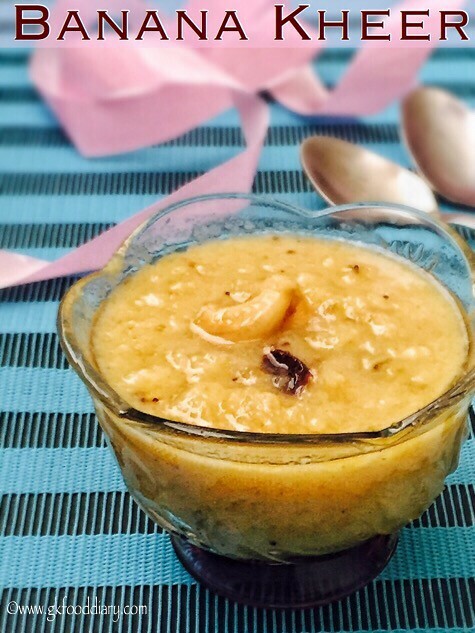 Make sure to introduce each ingredient separate before you try this banana kheer to your baby.